Time for a food post. 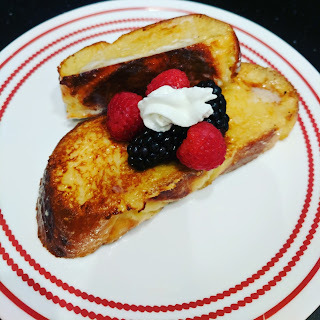 This is my favorite French toast recipe and it's based on Alton Brown's French Toast Recipe. I like to use Harmon's Challah bread or their White Chocolate Pecan bread. Challah is probably closer to traditional French toast, but the White Chocolate Pecan is really good too. Preheat oven to 375F. Combine half-and-half, eggs, honey, salt, cinnamon, vanilla, and nutmeg in a medium bowl and whisk to combine. The cinnamon has a tendency to float on top...don't worry if this happens, just mix it enough that there isn't any huge clumps. Dip slices into mixture and let it soak for up to 30 seconds per side (I usually do about 10 seconds). Place bread on a cooling rack over a cookie sheet and allow them to "drip dry" for about a minute. Melt 1T of butter over medium to medium-low heat and cook toast 2-3 minutes per side, until golden brown. Transfer to the oven and bake for an additional five minutes, then serve with butter and maple syrup. Repeat until all slices are cooked.